Synthaflow or Synthamax - Which Is The Best Choice For Your Car, Truck, or SUV? AIRAID offer two distinct types of air filter construction, Synthaflow and Synthamax, which not only differ in the materials from which each is constructed, but each offers specific advantages that benefit a wide range of vehicle owners. Regardless of whether you’re considering Synthaflow or Synthamax, it’s important to know that AIRAID premium air filter are constructed on precision equipment with the finest materials available employing an attention to detail that only fine hand craftsmanship can provide. Both the Synthaflow and Synthamax filters are the result of AIRAID’s ongoing commitment to research and development. The design process begins with the in-house engineering team using the latest 3-D CAD modeling systems. A portable 3-D scanner and rapid prototyping system allows AIRAID to test new products on its Superflow flow bench and verify the fit and finish on the vehicle. 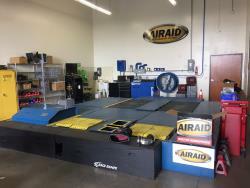 All products are then evaluated on AIRAID’s all-wheel-drive chassis dynamometer to validate their performance improvement. The role of an air filter is simple: trap dust and dirt that could damage the engine but at the same allow enough air through so that the engine can make as much power as possible. So while the concept is simple, the execution is difficult. Paper filters had long been the standard of the industry, but they clog easily. Foam filters suffer from the same problem. If you’ve ever removed and cleaned or replaced a foam filter on a computer or other electronic device, you’ll have noticed all the dirt on the outside surface and none inside the foam. Cotton is utilized as the filter medium in many high performance air filters, including the AIRAID SynthaFlow. In fact it’s nearly an ideal material for this use. Viewed under a microscope a cotton fiber is not what you’d image. It’s not smooth and straight like a cotton thread, instead the surface is slightly flattened and the fiber is twisted. This creates a maze that intake air can easily navigate but traps dirt and dust all the way through the filter (avoiding the problem with foam filters). In order for the cotton fibers to hold onto the dirt and dust particles, the fibers need to be oiled. And when the filter is serviced, all the trapped dirt and dust is washed off with the oil. Synthaflow, which AIRAID pioneered after exhaustive research and development, remains the standard of the industry. Synthaflow filter media is constructed with four outer layers of cotton fibers and one inner layer of specialized synthetic filter material. The five layers are secured with a steel mesh front and back and formed into a pleated configuration, which adds significantly to the surface area of the filter as well as strengthen the filter against high intake pressures. Together, these materials provide the high air flow of standard cotton media filters with the improved filtration efficiency provided by the fifth synthetic layer which captures any minuscule particles that slipped past the cotton fibers. This provides the SynthaFlow with an incremental advantage over filters that rely upon cotton fibers alone. The outer layers of cotton fiber are treated with specially-formulated filter oil that’s available for purchase for routine cleaning. The SynthaMax filter is truly a breakthrough in performance air filter design, utilizing an ingenious combination of materials to create a high performance “dry” filter. Whereas the SynthaFlow filters are considered “wet” filters because of their need to be oiled to operate properly, AIRAID has developed has developed a “dry” filter that doesn’t require periodic re-oiling to achieve outstanding product performance. The SynthaMax air filter consists of an inner and outer layer of wire mesh for durable support of filtration media as well as overall filter durability. The filter media itself consists of two distinct layers of synthetic materials chosen for their separate yet complimentary performance characteristics, delivering high air flow along with excellent filtration characteristics. The effectiveness of this design is so high that it’s referred to as Super Synthetic. Contaminants are first captured by the outer layer of what’s referred to as needlefelt polyester. Needlefelting is a process by which a dense and durable material like polyester can be converted into an excellent nonwoven filter medium. The inner layer of rayon and polyester are bonded through a wet process that assures uniform distribution, particularly of the rayon as it’s one of the most effective filter materials but requires the strength of polyester to retain its shape. 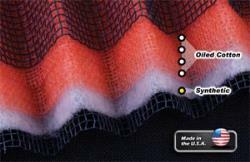 This inner layer of rayon and polyester captures any remaining contaminants while maintaining high air flow and low restriction. The resultant filter media that is more efficient with lower pressure differential than other “dry” media filters that are commercially available. 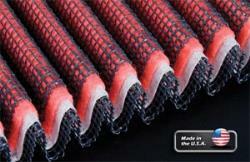 The combinations of these synthetic materials have a higher durability, as the fibers will not wash out over time. Like SynthaFlow, SynthaMax filters are designed to be removed from the vehicle and washed periodically. The different is that SynthaMax material does not need to be reoiled before being reinstalled. SyhtaFlow or SynthaMax: Which is better for you? The great advantage that AIRAID can offer customers is the choice of two different types of filters, manufactured with two entirely different sets of materials, with specific advantage for each type. Synthaflow is the best choice for high performance reusable filtration. In AIRAID’s own testing, two otherwise identical, brand new, SynthaMax and SynthaFlow filters were compared on a flow bench. The oiled-cotton/synthetic blend SynthaFlow was able to draw 820 CFM while the SynthaMax was able to draw 542 CFM. Now that doesn’t mean that the SynthaMax can’t deliver power. Chances are that its flow capacity is far greater than OEM. 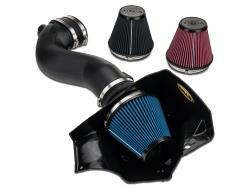 However, if you’re modifying your engine and need incremental intake air, the SynthaFlow may be your better choice. If you drive off-road a great deal, whether that’s off-road racing, driving to construction sites, or just to your favorite fishing spot, a SynthaFlow filter is recommended. If you travel almost exclusively on paved roads, your best choice is the SynthaMax. While both Synthaflow and Synthamax filters comes with a Lifetime Warranty, and are both washable and reusable. If you like things to move fast, consider a SynthaMax filter as it can be washed and reinstalled in the vehicle immediately. The SynthaFlow requires the filter to be dry after washing before applying the special filter oil, which can take up to 45 minutes. If you like things colorful under the hood, while SynthaFlow filters come in red only, many SynthaMax filters are available in red, blue, and black. SynthaFlow and SynthaMax filters are produced entirely by AIRAID using only the finest materials on highly specialized manufacturing equipment to ensure a level of quality control no other filter company can match. This is just one of many reasons why all AIRAID filters are backed by the AIRAID "No Hassle" Lifetime Warranty. 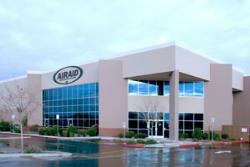 All AIRAID product lines are proudly manufactured in the USA.